Big Game Golden Party Giveaway! 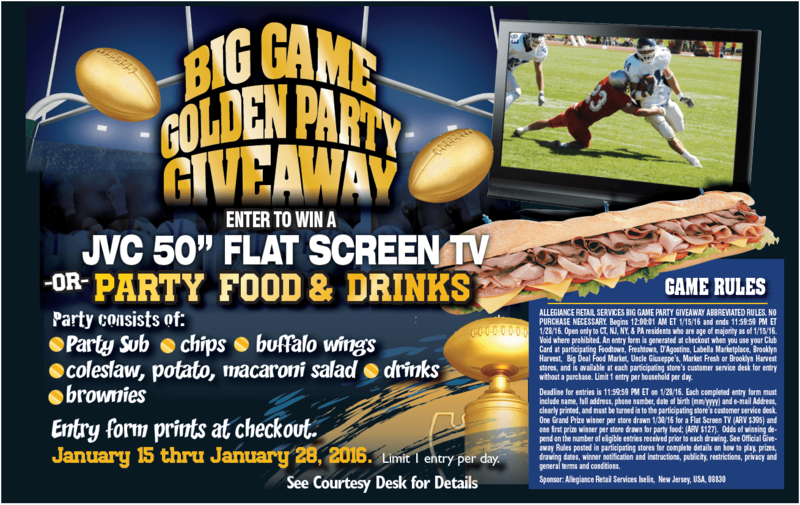 ALLEGIANCE RETAIL SERVICES BIG GAME PARTY GIVEAWAY ABBREVIATED RULES. NO PURCHASE NECESSARY. Begins 12:00:01 AM ET 1/15/16 and ends 11:59:59 PM ET 1/28/16. Open only to CT, NJ, NY, & PA residents who are age of majority as of 1/15/16. Void where prohibited. An entry form is generated at checkout when you use your Club Card at participating Foodtown, Freshtown, D’Agostino, LaBella Marketplace, Brooklyn Harvest, Big Deal Food Market, Uncle Giuseppe’s, Market Fresh or Brooklyn Harvest stores, and is available at each participating store’s customer service desk for entry without a purchase. Limit 1 entry per household per day. Deadline for entries is 11:59:59 PM ET on 1/28/16. Each completed entry form must include name, full address, phone number, date of birth (mm/yyyy) and e-mail address, clearly printed, and must be turned in to the participating store’s customer service desk. One Grand Prize winner per store drawn 1/30/16 for a Flat Screen TV (ARV $395) and one first prize winner per store drawn for party food; (ARV $127). Odds of winning depend on the number of eligible entries received prior to each drawing. See Official Giveaway Rules posted in participating stores for complete details on how to play, prizes,drawing dates, winner notification and instructions, publicity, restrictions, privacy and general terms and conditions.